When will "Natural Cover" be fixed? Because it gets activated in the battle and thus isn't visible in the garage perhaps? Edited by Bruecki2938, 16 April 2019 - 12:53 PM. Well tbh, this is the first time I've heard of it. 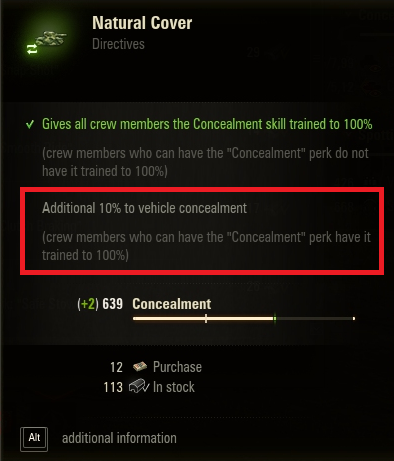 Because on my tanks that I use it on with a crew with less then 100% camo on each crew member. It goes up, not down. And on the few that has 100% camo on each member. It still goes up. Be that in the garage, or the comparison tool. You sure it's not a mod screwing it up? And yes, they all have bia, vents etc. Edited by Balc0ra, 16 April 2019 - 12:53 PM. Yes it goes up... but not to the value it should.... because it doesn't add stuff that increases the basic skill of the crew members... is reading that hard? Edited by barison1, 16 April 2019 - 01:04 PM. Is the bug present in came or just in the comparison tool? WHUT? What is wrong with you ppl? Did you even look at the screenshots? Edited by Bruecki2938, 16 April 2019 - 01:07 PM. no wonder you are in meme....... THE FIRST TANK WITH THE CONCEALMENT SKILL DOESNT HAVE THE DIRECTIVE EQUIPPED SO IT CAN/HAS NOT THE ADDITIONAL 10 PERCENT BONUS OKAY!!!!!!!!!! They should add up to the same amount but they don't. Edited by Bruecki2938, 16 April 2019 - 01:19 PM. tryit always this toxic? trying too hard perhaps? So have you actually tested this in game and proved there's a bug or you just complaining about garage numbers? Edited by Bruecki2938, 16 April 2019 - 01:26 PM. 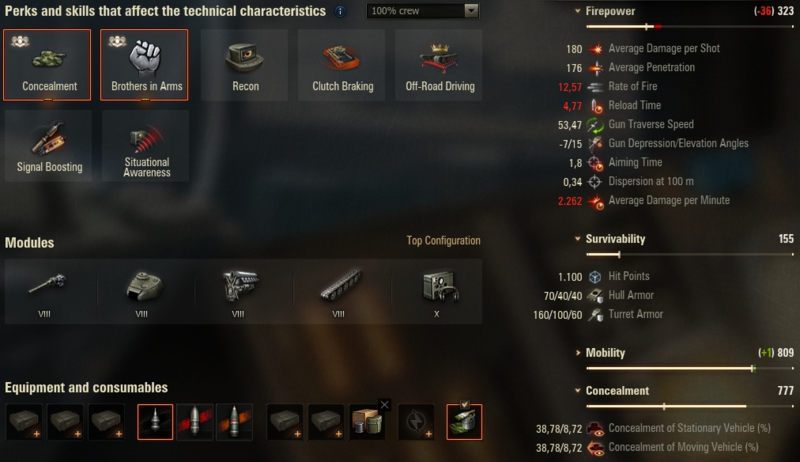 Game GUI is pretty bug ridden, WG doesnt seem to mind much. Here's my Comet being locked after dying in random game. One of those things that make you go "hmm." 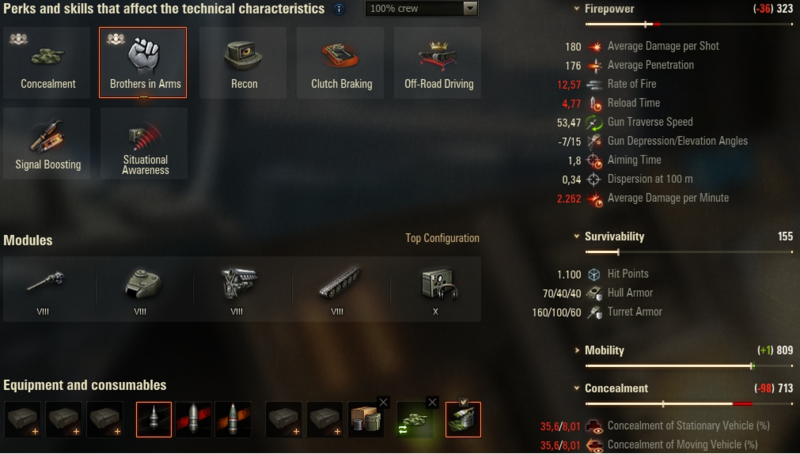 Maybe it's so OP OP WG thought I will use it in tier 8 CW. Not saying it wouldn't be nice to fix it anyway but I suspect it's just the comparison tool. Mind you, the last time I said "there's no way they would do it that way" regarding camo programming, they actually did it that way. Last time I tested it in the training room it was bugged "in real world" too - others did the test too. As they values are still off I assumed it's still not fixen BUT I'll test it out again tonight! Best get your knickers untwisted before you get back to real life pal.